Beef brisket is not a tender cut of beef. It requires some lengthy cooking to tenderize it and people compare it to roast more often than not. Beef brisket is versatile in the way it can be cooked and the various ways it can be served with other side items. 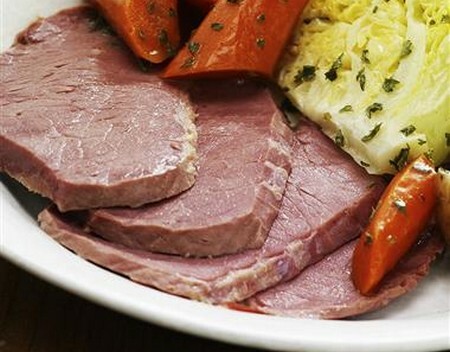 Decide which cut of beef you will cook You can use the point cut or flat brisket. The point cut beef has more flavor. However, the flat brisket has less fat in every serving per pound. Also, shredded beef recipes should use this cut. Do not trim the fat off the brisket when you’re cooking it. This helps keep the meat moist. You can cut it off before serving it up on the plate. Prepare the gravy if you plan to serve it with your beef brisket. You might need to remove the grease from the gravy. Season your beef brisket with a rub. Use plenty of seasoning. You can make this beef in a pot with onions, pepper and salt. You can add to the flavor with garlic and more seasonings. There are two methods you can use to cook this brisket. You can use a large crock pot, smoker or oven. You can enhance the flavor of the brisket beef by cooking it on low in the oven at 300 to 325 degrees. Add some water to the meat to keep it moist. You can use the drippings in the pan to make a gravy to accompany the meat. Brisket when cooked slowly can turn out beautifully over a period of 5 to 6 hours. Position the meat with the fat facing up. The pan should be oiled. You can use a rack as well. Add vegetables that will add to the flavor like onions. Make a bed for the meat. Now, cover the meat with a top or aluminum foil. Adjust the oven to 325 degrees. Put the brisket in for an hour. Put about a cup of vegetable or beef broth over the roast. Add just enough to cover the brisket. Cook the brisket covered for 1 to 2 hours. The inside of the meat needs to be 160 degrees. If you want use a barbecue sauce, then measure the liquid out to ½ cup. This is where you can add the barbecue sauce and vegetables. These go in at the final 45 minutes if you are using the oven. If you are using the slow cooker ad these at the 90 minute mark. Allow the meat to set for 15 minutes prior to dishing it up. Slice the meat with the grain. The meat will have a noticeable texture different in the meat. Serve the meat whole meat.